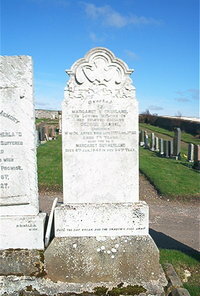 Erected by Margaret Sutherland in loving memory of her beloved husband. George Barnie of Boultach died 15th August 1920 aged 75. Wife Margaret Sutherland died 6th January 1946 aged 94. Until the dawn breaks and the shadows flee away.